I haven't made this one, but I love Amy Butler patterns -- so well written and easy to follow! I've made her gum drop pillows and a whole lot of the frenchy bag. never tried this but I thought I'd chime in to say that I prefer more of a sleeping bag style with a slip in enclosure than a four flap opening like the bag in the photo. The flaps seem like they would take up so much space and just get in the way. im here to second a few other people. I havent made that particular pattern, but i have made a few of amy butler's other bags and her patterns are easy to follow and well written. I invest the $12. I don't want to go somewhere you weren't thinking but my best friend is making this for her kid's teachers. It doesn't involve any sewing and might be just the ticket! Um, but to answer your question, I haven't made that particular pattern before. I just really liked the felt pattern! Here are some free tutorials. They even use cute Amy Butler fabric for theirs. It holds the computer nice and tight and keeps it from getting damaged while in my bag or just carrying it around. My sister also has one and loves it! Haven't got the laptop pattern, but I have used her Big Sky Hat pattern and it is great. As for a laptop sleeve, I just measured my laptop, added 2 inches all around and cut out 4 rectangles -- two of an outside fabric and two of a lining fabric. Then I would make four little rectangles about 2.4 inches by 6 inches, and get some velcro or a couple of buttons. Stitch the little rectangles like pillowcases into two little straps. Add button holes or velcro. Then stitch the outside of the cover like a pillowcase or simple bag, around 3 sides. Stitch the lining the same way, but leave a hole for turning. Pin the straps to the top of the outside on the right side, put the outside of the bag inside the lining and stitch around the top. Flip it all right side out through the hole in the lining and then stitch up the hole. Then topstitch around the top, add buttons or velcro to the front, and you're good to go. I like this because I can put my laptop in the sleeve when its hot with the vents on the open side and I don't have to worry about silicon meltdowns. I also have a pocket on the front of mine for a pen and notebook, because I'm just one of those people who needs a pen, even though they've got their laptop . . . Does that make any sense at all? If not, never mind. Proceed with reading the more intelligent comments. Forgot to add that I used cordoroy for the outside. If you wanted to use cotton, like AB's, you would probably have to iron some interfacing to the outside fabric. I have this pattern and made it for my husband and while the pattern is really clear and helpful, if I'd thought about it befor emaking I probably could have come up with the same thing. The main thing I got from the pattern is how to make it padded and secure. Hope that helps! I want to make a laptop case for my laptop. I'll have to check some of the recommended tutorials. If not already mentioned there is a tutorial over at Sew Mama Sew that was posted in November - I'm not sure which day - maybe the one with gifts for students. I was hoping to tackle this for my daughters. Larissa had a good blog to go to. Just lay the laptop onto the fabric to get the right size. You might want to put a better closure on it and handles for carrying. That one looked good to me. I believe in trying to work out a pattern for yourself. Wow. This has been educational. 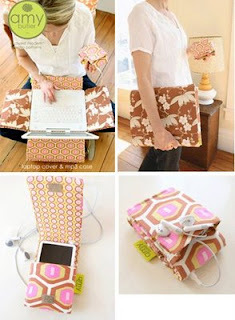 I went through each comment and went to each blog...some were duplicates..and saw some great ways to make laptop bags. Thank you, everyone.